The name ‘Les Grands Chais de France’ may not be familiar, but those who have perused the wine shelves of our major supermarkets will certainly recognise the names of some of their big volume brands, including the JP Chenet wines from across France in their distinctive crooked bottles, and the Bordeaux wines appearing under the Calvet label. In fact, Grands Chais, still a family owned and run company, is the world’s biggest exporter of French wine, and in the top two or three producers in France in terms of both volume and value. They have over 2,000 employees, and three massive bottling facilities in Alsace, the Loire and Bordeaux. 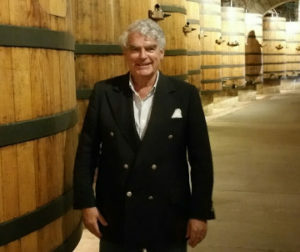 Founded by Joseph Helfrich only in 1979, the company has grown with phenomenal speed, but it is more recently that they have evolved from négociant, bottler and distributor of huge quantities of wine, to substantial estate owner too, focused on Bordeaux. 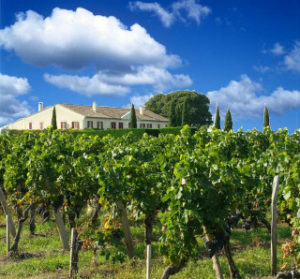 Indeed in the past decade they have acquired 15 properties in Bordeaux, including highly regarded left bank Crus Bourgeois, and some well know estates of the right bank, including St Emilion Grand Cru Classé Château Cantin, and Clos Beauregard in Pomerol. They have also acquired exclusive distribution rights for a number of other prominent and high quality properties. On this whistle-stop two day trip I was invited to visit and taste at a few of their Châteaux across the Bordeaux region, to see the other side of this huge business for myself, and one that until now has been developing quite quietly and discreetly. Perhaps the company felt the quality was now right to throw their doors open just a little wider? I was greeted at Merignac airport by bright young Australian manager, Emma Holland. 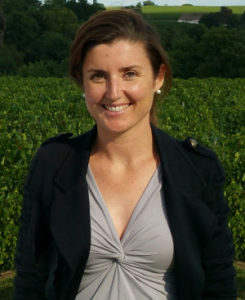 Emma is a Roseworthy-trained winemaker who has worked in Australia, France and California, but who has been with Grands Chais for two years now on the commercial side of the business. Emma explained that the company has been putting significant resources into the new Bordeaux estates it has acquired (several from Bernard Magrez, who has been selling off a number of properties). That rolling programme of improvements is being overseen by senior winemakers who look after the right and left banks respectively, with the input of Michel Rolland and Hubert de Boüard as consultants. There are 150 different wines in the Grands Chais portfolio. It is a complex, market-led global business, and that means 14,000 different SKUs (Stock Keeping Units) – blends for different markets, bottled under screwcap or cork, different labels tailored to the market, etc. This sure ain’t the tale of an artisan winegrower and his hand-labelled product, but I was really keen to discover what these Bordeaux properties had to offer. Grand Cru Château Cantin covers over 30 hectares, 86% planted to Merlot on clay and limestone soils. 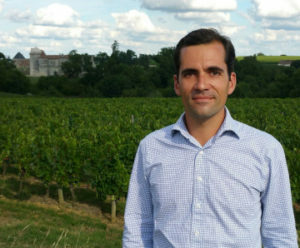 Vineyards surround the Château, which Grands Chais took over in 2007, bringing Michel Rolland in to consult. I met up here with Sebastien Villenave (right), in charge of all the Grands Chais right bank properties, who explained that there has been a big restructuring programme here, planting more Merlot in favour of Cabernet Sauvignon, especially one particular vineyard where the Cabernet failed to ripen because it was in one of the coolest spots on the estate. The oldest vines are 40 to 50 years old, and farming follows the ‘Lutte raisonnée’ philosophy of regular soil and vineyard analysis to spray or fertilise only when needed, not by routine. There are various levels of fruit sorting employed both in the vineyard and at the winery, and 100% of the Grand Vin goes into barrel, 70% new, and predominantly from Burgundian coopers. (2016) Oak is a tiny bit raw on this at present compared to the 2011, but with lots of fruit substance beneath, and that comes through really nicely on the palate. Again that agility and a nice concentration of fruit and fruit acidity gives this density without heavy oak influence. A direct, grippy, youthful wine that shows considerable promise. (2016) The first vintage fully vinified by Grand Chais after acquiring the property. Immediately refined, plenty of plushness, but a degree of elegance too. The fruit is lighter in the red and black fruit spectrum than the 2012, with a lovely agility on the palate, tight tannins - quite grippy at the moment - but good acidity and a penetrating freshness. This should also cellar another five years quite easily. (2016) Similar aromatic to the 2011, though the sandalwood exoticism replaced by a slightly deeper, slightly richer and Christmas cake spiciness. Very good cassis ripeness. On the palate it has delicious lick of acidity and firm tannins that give it real structure and a bit of grippy persistence. Delicious and long, with a lovely balance. (2016) An estate Grands Chais took over in 2010, including stock. 2011 was bottled, but not made by Grands Chais. Lots of exotic spices and Sandalwood here. A touch of resiny quality, but really plush and inviting, a hint of briar and that exotic spice continuing. The palate has good life and energy, and a buoyant juiciness. (2016) There's a nice red liquorice stripe to this, with a hint of meatiness too, but yet again the house style of deep and luxurious oak character and plush fruit is there. Not quite so rich and full on the palate as the Faizeau, very dry and nicely in balance, and I like the 'quieter' quality of the oak, though admittedly it does not quite have the mouth-filling presence of the Faizeau. Not stockist and price quoted at time of review is for the 2011 vintage. Another Grand Cru property, where I was met by manager and winemaker David Suire (right). This is a Grands Chais partnership: they have exclusive distribution in all markets, but the beautiful property, parts of which date to the 12th century, has belonged to the Beaumartin family since the 1930s. With 61 hectares of vines it is the biggest single property in St Emilion. Soils are mostly clay on limestone, varying from 30cm of red clay in the west, to 100cm on the east. “The thinner soils are more like Château Trotteville,” says David, “the richer soil more like Troplong Mondot.” In 2015 David dug 250 inspection pits in an attempt to understand the soils, and why there can be 10 days difference in maturity across the parcels. He has stopped use of herbicides and is growing “more or less organically,” ploughing, and using cover crops between rows. A Grand Cru Classé since 1996, only part of the production goes to Château Laroque, around half going to Château Peymouton, effectively a second wine, though there is also the official second wine of Laroque, called Les Tours de Laroque, from soils without limestone. (2016) This has a much more dense and spicy character on the nose than the 2011, more density and showing the oak a little more, but also the meatiness of the structure, the density of that mid-palate fruit, but the acidity is good again – a cherry brightness, with tight, grippy tannins and another wine that undoubtedly needs some time and best to decant if opening now. (2016) Nice, quite light colour with some transparency. A gentle earthiness and light leafiness. Lots of cherry character, lots of raciness and elegance, dry with a grippy tannin structure, but a nice little rounding of oak and good acidity – indeed the acidity drives this and gives it potential longevity. (2016) Much more pure black fruit essence on the nose compared to the 2009, and a very solid youthful colour. Cedar and gentle spices, and little violet and herb notes, but very ripe, very black fruited. A really substantial wine, great concentration and intensity, the tannins very fine, but grippy and lovely acid freshness. A terrific wine, great concentration and purity. (2016) Lovely hint of warmth on this – just easing close to maturity. Deep, earthy and spicy, the cedar and meaty character is lovely, then onto the palate it fills the mouth with substantial creamy fruit, a big scaled wine, plenty of depth and power, but not without charm – little subtle floral and cherry notes, and a sweetness matched to the acidity and solid, creamy tannins. In 1935 six and a half hectares of prime Pomerol vineyard was separated from Château Beauregard, and sold to the Moueix family. 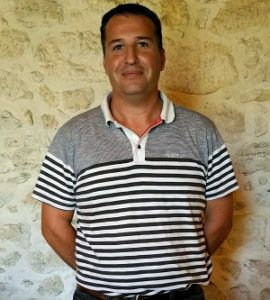 Clos Beauregard stayed in the Moueix family until its recent purchase by Grands Chais, who now have Michel Rolland as consultant winemaker, with Sebastien Villenave managing this estate too. The 40-year-old vines are 98% Merlot, planted on sandy soils. Once again Lutte Raisonnée is practised, and Sebastien tells me currently only five hectares are in production, because in common with other recent acquisitions, there has been extensive replanting. The Grand Vin sees 100% new barrels each year, and as well as the big projects to improve the vineyards, they are also adding temperature control to the maturation cellar, and have introduced new basket presses and a new design of de-stemming machine that is much gentler on the grapes. (2016) Not yet released, this barrel sample showed smokiness and a slightly raw oak character at this stage, a little resinous, but a seam of rich black fruit beneath and a definite sense of chocolaty density and richness. Real power and structure here, the meaty core of this is pretty massive – these are big, serious, very structured wines, but not over-extracted. Price shown for the 2012 vintage at time of review. Score is provisional. (2016) A little more perfume here than the 2011, some cherry skins and a plummy fruit again, but such a welterweight of tannin in the mouth at present, just loads of structure and grip, spicy, meaty, the grip of tannin and oak just a little too strident for enjoyment at this stage. Needs time for sure. (2016) Quite a deep silky, compact, but fruity nose, closely wound and tight aromas of black fruits and meatiness, but really quite closed. A substantial wine on the palate, with a meaty weight of savoury fruit, tight tannins structure, perhaps needs a little time to just ease a little – very tight with chewy tannins.Give it a few years. I also tasted two Pomerol wines from Château La Patache, another exclusivity for Grands Chais and owned by Hong Kong businessman Peter Kwok. (2016) A sense of ripe gaminess to this 2012, with meaty, smoky notes from the oak, but also a ripeness to the fruit. Lovely fruit sweetness comes through, the first wine of this five-wine tasting where the sweetness of the fruit is winning against the tannic heft of the structure, finishing on sweet fruit and spice. Plenty of sour cherry acidity to freshen the finish too. (2016) A nice perfume here, before a big sour cherry and black plum skin grippy palate, that big raft of sour flavour is lovely against the touch of chewy tannin and the little chocolate richness of the barrel. Long, fresh, tannic at this stage. In wellies and working gear, secatuers in hand, the no-nonsense Danish-born Merete Larsen met me at Château Lestage Simon. 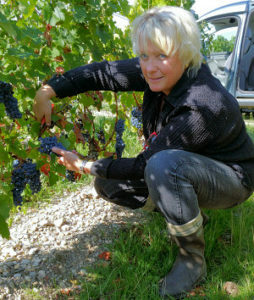 We’ve now crossed the river to the left bank, where Merete is senior winemaker in charge of all Grands Chais properties. Sited mext door to Sociando-Mallet, Merete half-jokingly describes this area of the left bank as “Little Pomerol,” with mostly clay soils meaning that Merlot dominates. Merete spent 20 years at 5th growth Belgrave, and in a dozen years at this estate has seen new cellars built and a lot of replanting of new vines. She has divided the vineyard into 17 different parcels, including some where gravel patches dominate over clay and Petit Verdot and Cabernet Sauvignon create “The spinal column of the wine,” according to Merete. She employs a fascinating method of de-leafing in preparation for harvest, burning off the lower leaves around maturing bunches using a large toaster mounted on a tractor. “It takes three hours per hectare as opposed to 50 hours doing it manually,” she says. Legumes and grasses are planted between rows in the 40-hectare estate, that competition giving natural yields of around 48hl/ha (whereas 56hl/ha is allowed). (2016) Fragrance here, the lovely combination of creamy and tobacco notes with a tight, refined fruit quality. The palate has a little meat and chewy tannic structure, but there is good freshness again. Not at all heavy, showing a nice drinkability but there is some depth and weight here too, savoury and nicely balanced. (2016) Deep and full, a little richness. There is a red plum fruitiness to this, but then there is a tight structural element too, grippy from the tannins, but also a cassis and cassis skin bit of grip and tension, the wine staying lively and focused, the sweetness reasserting in the finish. Delicious in the end. (2016) Lovely harmony here, fine oak character melting seamlessly into the fruit, with a little plum and balsamic note, but fresh and inviting. Great fruit sweetness on the mid-palate, a really pure cassis, delightful balance, the gentle spice of the barrel, dry, fine tannins and good cherry skin and plum skin grip and acid. Surely a good 10 years cellaring potential? (2016) Lovely fragrance of quality oak here, a touch of coffee, but mostly about exotic spices and Sandalwood, the fruit full and rich beneath, highly inviting and promising. A real big mouthful of cassis and glossy black plum, the tannin are fruity and dry, but the flesh of the fruit and the spice of the barrel are delicious. Long and layered, this is impressive Cru Bourgeois, with great length and the sweetness inherent in the fruit persisting. (2016) A high 25% Petit Verdot in the blend here, aged in 50% new barrels. Delightful nose, with spices and a hint of real exoticism, plenty of fruit too, dense and sweet, with some floral aspects on the nose that translate into a fine, sweet fruit core, good structure and a lovely tannin and acid balance. Five years+ cellaring potential. (2016) Charming nose for this second wine of Cartillon, a really plush and forward cherry and plum, even a touch jammy, but delightful. Small spice and toast notes. Soft and juicy on the palate, very pleasing stuff with juiciness and soft structure. An approachable Bordeaux at a modest price, and I scored the 2011 and 2012 exactly the same. (2016) The first vintage from this 2.5 hectare estate that neighbours Lascombes, vines on average 41 years old, but some plots 80 years old. This Grand Vin sees 100% new oak, and this was a barrel sample. Real perfume here, a lovely floral character that has real lift and buoyancy, with great purity to the black fruit, very fine, very scented and aromatic, and the tannins are very silky and fine. Lovely balance. Should be available in autumn 2016. Score is provisional. The final estate in this report is another exclusivity of Grands Chais, where winemaker and owner Pierre-Gilles Gromand-Brunet d’Evry, every inch the aristocrat and enthusiast, with his viticulturist wife, Marie-Hélène, oversee a fascinating family business steeped in history, and run very much on their own terms. All varieties are harvested and vinified separately, including 10% Petit Verdot and “A tiny trace,” of Cabernet Franc along with Merlot and Cabernet Sauvignon. Optical sorting is used to eliminate any grapes that don’t meet the standard. After free-run juice around 33% of the harvest is press wine, but they use only the finest 7% or so, the rest is sold. After fermentation the wine is pressed straight to barrels, and then barrels assessed individually and graded for quality. There are four rackings in barrel (“Just like a Grand Cru,” Pierre-Gilles reminds me) and the wines are fined with organic egg whites. The photograph shows Pierre-Gilles with their vats in a room rebuilt under Professor Emile Peynaud. Peynaud preferred cement vats, but Pierre-Gilles’ parents wanted wood, so the vats are in fact cement, clad in wood to give a very traditional appearance. I so enjoyed this visit and lunch with the family afterwards, so am delighted to say the wines were also very impressive. (2016) Oak showing quite obviously in this barrel sample, but a lovely rounded balsamic and sweet black fruit quality comes through, really good concentration and ripeness, pepper and spice and lovely tannin structure giving a firm, liquorice twist. Really promising, but score is provisional. Corney & Barrow are importers, but they list the 2012 at time of review. (2016) Very pure, dense, sweet black fruit, creamy, with very nice mouth-filling and coffee touched character, great tannins and fresh cherry acidity. Lovely balance. Long and composed, but with great fruit expression. (2016) Served blind. Fine colour, rim showing a lovely brick hue. Very fine nose, pure black fruit but meaty and dense with great richness and some fruitcake spices. The palate has lovely fruit sweetness, richness, and fantastic spice. A gamy quality but not leathery - stays beautifully sweet fruited and long. No UK stockists at time of review, but wine-searcher shows various older vintages. (2016) The second wine of Lamarque shows lovely bold, fresh red fruits, but it has good structural elements and very qood spice and freshness. Up-front fruit making it so easy to drink. Ocado stocks this wine, and online is showing the excellent 2010 at time of review. (2016) Delightful earth and cedar character here, the sweet fruit ripeness and fruit concentration is terrific, but the cedar and supple, creamy tannins impress. It really is a very complete and harmonious wine - Pierre Giles says everything from 2010 could have been Grand Vin, so in theory, this could be too.